Tosha Stimage, Point & Shoot, 2017, woven rug, 60 x 36". Tosha Stimage stages an analytical memorial of black mourning to address the loss of both life and meaning that accompany death turned into spectacle. The language of flowers offers an entryway into the artist’s system: Her diptych painting Vanitas (all works 2017), featuring a diving human body (reminiscent of a chalk outline) filled with collaged flowers, alongside a panel of the title, renders a Conceptualist interest in sign systems as colored by floriography and the tradition of vanitas painting. What happens when the meanings of symbols and names are forgotten or misunderstood? On an adjoining wall, the mural For the Dead offers up dozens of nearly identical packets of forget-me-not seeds hung in a graveyard-like grid, substitutes for anonymous figures under the watchful eye of a monumental Hermes carrying blossoms arranged within the global corporate flower company FTD’s logo. As a counterpoint to this kind of erasure, Stimage is also intrigued by what happens when the determination of content is merely delayed, in both the way we interpret symbols or everyday signals, and those other snap judgments that lead to the deaths of black people and the way they are quickly grieved via media blitz and then forgotten. 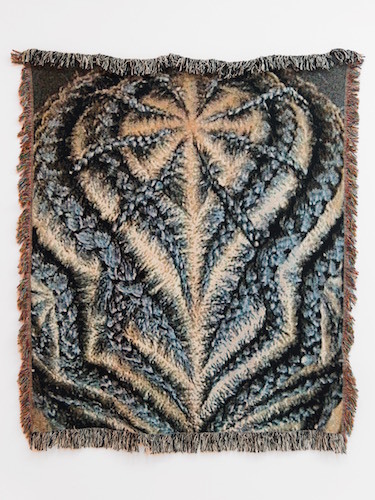 A woven rug titled Point & Shoot depicts the back of a braided head, but the image is difficult to decipher, giving pause to a gaze that’s become inured to violence and turning the inability to interpret into a political call to slow down for vulnerability.